ProProfs supports Single Sign-On (SSO) which will allow you to authenticate your end users using your authentication service, such as your web application's login. Once verified, your end users can then view your ProProfs site. However, if your end users navigate directly to your ProProfs website without first authenticating, they would be redirected to your login page. Single Sign-On (SSO) works as a "shared secret" between ProProfs and your local application. When Single Sign-On is enabled, end users are redirected from ProProfs to a login page located on your server. End users log in to your web application just like they usually would. Once successfully logged in, a script will execute and tell ProProfs that the end user is authentic. ProProfs then grants access for the end user to view your ProProfs site. A shared API key between your local authenticating mechanism and ProProfs is the basis of Single Sign-On (SSO). This API key is used to generate a hash used by ProProfs to ensure that end users have permission to visit your ProProfs site. Below is the outline of some used cases. Your end user attempts to visit your ProProfs site when Private Site is enabled (either by directly going to the URL, e.g., mysite.helpdocsonline.com or by using a bookmark). ProProfs will check the end user's browser session to determine whether the end user has already been granted access to your ProProfs site. If access was not previously granted, ProProfs redirects the end user to your login page, located on your server (such as http://ourdomain.com/login). The end user logs in to your web application or authentication system in the usual way. When the login is successful, a script runs on your web application. This script passes to ProProfs your site_url, return_page, and md5 API key. ProProfs will match the API key to make sure it is authentic. Then your end user is redirected back to your ProProfs site, and a browser session is established. The user can then browse your ProProfs site. Once the end user logs out or closes the browser window, the end user will be required to reauthenticate as described above. You can also set up this feature, so your end users aren't redirected back to your login page when they visit your ProProfs site. When your end users log in to your web application, you can authenticate them to establish a session with ProProfs immediately. Then if your end users visit your ProProfs site, they will not be redirected and can view your site directly. Your end users log in to your web application. When the login is successful, the SSO script logs out. The end user is authenticated, a session is established in ProProfs (while the end user is still on your site). If the end user clicks a link or goes directly to your ProProfs site, they will be able to browse your ProProfs site without having to authenticate. api_key (required) - The hash-encoded API key is the shared secret between ProProfs and your local website. You can access it from Settings > Private Sites. return_page (optional) - You can also pass the page URL. For example, if an end user visits a specific ProProfs page (such as http://mysite.helpdocsonline.com/pagename) and is redirected to your web application to log in, you can return them to that particular page after they are redirected from your login page to ProProfs. site_access (optional) - Specify the ID of the sites that the user is allowed to view. For example, let's say you have ten different websites, but you only want the user to be able to access two of them. You can specify the IDs of those websites, and the end user will just be able to view those sites. Be mindful of separating multiple websites with commas. Usage of the above parameters is further defined in the sample script. Check Turn On Private Sites. Select the sites you want to make private. Then check Turn On Single Sign-On. The following settings also appear. API Key - For SSO to work, the API key must be passed to ProProfs. The API is a shared secret between you and ProProfs. It must never be publicized. Copy this API key to add to your SSO script. You can also change the API key at any time by clicking Regenerate. It will generate a new API key and invalidate the old one. End users can only view the site they log in. They do not have access to your other websites. Having this checked means if a user logs in from site1 and then went directly to site2, they will be redirected back to site1. NOTE: you can also use the site_access parameter to define which sites the end user can access. Auth URL - This is the URL that a user is redirected to in case of an attempt to view a private site page, but there's no valid ProProfs viewer session yet. In this event, we always pass the page and website that was being accessed using query parameters site and return_page. It is handy because the tendency is to redirect the customer back to the previous page after being granted access to your scripts. Logout URL - This field is optional. If a Logout URL is entered, the Logout link in the help site ends the viewer session on ProProfs and then redirects the user to this URL. Save - To save the settings. We have provided a sample PHP implementation, which you can use as a guide when you incorporate SSO feature into your authentication system. You can download these PHP scripts containing comments at https://github.com/proprofs-account/sso-php. You can also download an ASP.NET version from https://github.com/proprofs-account/sso-php. The sample SSO scripts are at work whenever a user without a valid ProProfs viewer-only session visits a page on an SSO enabled private site. The script will do a check to see if the user is already logged into your web app and will allow the user to view your ProProfs site or redirect them to your login page. The redirects are browser-based and do not require ProProfs to access your database, network, or authentication system directly. In a nutshell, what the system is doing is triggering a remote URL on our end along with your private API key to initiate a valid viewer-only session for your help site. This sample implementation assumes that if a user logs in, you want to give that user access to the help site. Your developer can be creative and alter this criterion based on how you do your authentication. This file is merely initiating an object of class ProProfs_SSO_Support. You can set your site parameters in this file. It calls the do_ProProfs_authorization() method which does several things in this demo app. It's explained in detail in the class file. // If no value is set and the parameter is not included then we allow access to all sites. This file contains the ProProfs_SSO_Support class. This object is responsible for checking whether a user is logged in to your web application, and controls the redirection to URLs that are needed for different use cases. ProProfs_check_local_session() assumes you identify that a user is logged in to your app if there's a user_id key set in your PHP $_SESSION variable. // Upon login of your application or website, a session is established for the user. // This code will check the users session to determine if they are logged in. // You can replace 'user_id' with whatever you want such as username, email, etc. // All the system is doing here is checking to see if there is a value. If there is no value, user requires to log in. // If there is a value, pass the site parameters to http://www.helpdocsonline.com/access/remote/ and establish a session on ProProfs. ProProfs_destroy_local_session() which assumes that unsetting the user_id key in PHP $_SESSION variable terminates your web app user's session. logout_ProProfs() terminates the web app user session and then logs out the user. Then, it terminates the ProProfs session. After the session is terminated in ProProfs, behind the scene, it redirects to your Auth URL but passes as parameter action which is sets to action. do_ProProfs_authorization() does the heavy work and runs everytime a page is accessed on a private site but no valid ProProfs session is available. This is the case in our sample implementation as it's being called in the Auth URL. //If Remote logout URL is entered in ProProfs the 'log-out' link can destroy the end-users session in ProProfs and the session on your web application. Now let's look at login.php closely. We made it so that if the user logs in with username: demo and password: demo!, they are assumed authenticated. We set $_SESSION['user_id'] = 1. Your authentication system will definitely be much more complex than this. Also, in this file, we have the behavior that if the user successfully logs in, they will be redirected to a test.php file in your web app unless there's a URL parameter site and an optional return_page which will be used to redirect back the user. The test.php file just shows a logout link which points to the logout.php script. It demonstrates how to effectively logout the web app user and then logs out the ProProfs session too. Destroy the session for the web app user. Note: We were assuming that you are merely using something like a $_SESSION['user_id'] to indicate whether a user is logged in or not. Your implementation will be much more complicated than this, and your developer needs to update it based on how your authentication system works. Then terminate the viewer session in ProProfs. Then we redirect back to the Auth URL, but this time with query parameter 'action' being set to log out which is caught by our sample script and just redirects the user to the local login page we have in the SSO class file. If you need a script in another language, such as Java, you can follow the above examples and create your own. Please feel free to send us any samples. Since you will no longer be able to visit your ProProfs site directly, you can log in at http://www.proprofs.com/knowledgebase/login/. Note: Single Sign-On is for end users only. You will still need to log in to ProProfs as you usually do. You can set up ProProfs so that only the logged-in Zendesk users can access and view your documentation. If an end user navigates directly to your ProProfs site without first logging into Zendesk, the end user would not be able to view your ProProfs documentation. Zendesk handles the authentication of your end users. When the end user clicks on the Documentation tab in Zendesk, Zendesk will pass the API key to ProProfs and authenticate your end user so the end user can view your ProProfs site. The API code will automatically be included in the Zendesk Documentation-tab code snippet which ProProfs provides. 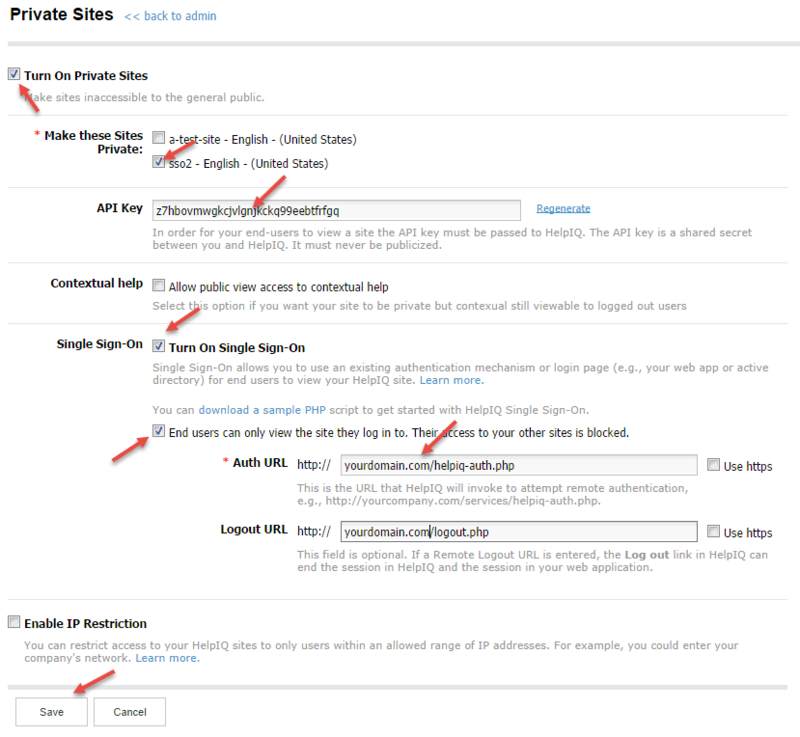 To use Zendesk authentication, first set your site as private (as defined above). Then follow these steps for adding a documentation tab in Zendesk. Replace API with your API key. For this method to work, add the URL+API key to a hyperlink on your referring web page. Then when the user clicks on the hyperlink, the API key will be passed and the user will be granted access to view your ProProfs site.